Tony Christiansen is a world-leading motivational and inspirational speaker. He is humourous, bold and straight talking as he brings you a story you will never forget. Tony has no legs, a result of a horrific train accident when he was 9 years old yet has achieved remarkable feats in his life. He shares his life story and the secrets to his incredible success. He encourages his audience to set their own challenges, rather than accept the limitations imposed by their own attitudes and other people's perception. Tony has spoken to people from all walks of life, from powerful politicians and successful business people to veterans and students, across many countries and cultures. His story is one that everybody will relate to. It is an unforgettable and inspiring story. You will laugh. You may even cry. His message is important and you will go home believing that nothing is beyond your abilities. Commanding standing ovations around the world, Tony Christiansen will break through and his story will hit right where it matters. into your team, you have found him. This sneak peek will give you an idea of the awesome and inspirational presentation your audience will be watching. 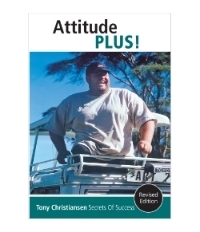 In Attitude Plus!, Tony shares the secrets of his success in his trademark down-to-earth manner. This book includes Tony's account of his climb to the summit of Mount Kilimanjaro. You will laugh. You may even cry. But you will never forget.